February saw me focus on my Pinterest account. It has been neglected in the past. I gained 138 followers in 2015 and in 2016 I only gained 34 new followers. When it came to working out my 2017 targets I took the average of these two, added it to end of December 2016 total then added to it making it a "stretch target"
Rounded to next 100 would be 700, then to make it stretch I added 50. The target I set for 2017 was to get to 750 followers and I thought I'd done myself a mischief at the end of January as I "tidied up" and deleted some boards. I'd forgotten people can follow boards individually rather that your main profile. My figures dropped by quite a significant number but I ended January having gained 97 new followers. 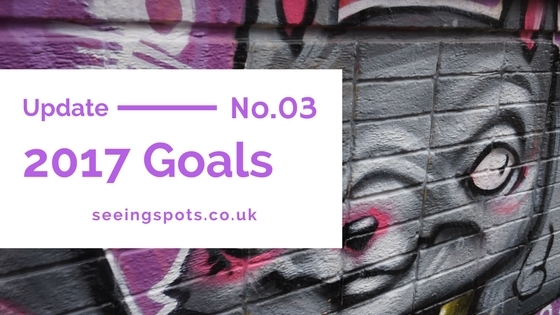 As part of my February Focus I decided to try and meet my end of year target, As I'd had such good growth in January, I only needed 62 new followers and thought it would a push but worth trying. I've joined in with some Facebook groups, I've been tweeting my Pinterest link to the point where I must be annoying people (sorry) as well as searching for new people to follow myself by following some of the people whose pins I'm pinning. Another thing that I've been doing is to make sure I add my YouTube Videos and blog posts to my account. In addition to this, I have been trying to take better pictures and using Canva to make what I think are Pinterest friendly images to share. I have also joined a group board and have only shared 4 pins so far. Are you a member of group boards? On the 10th February, I updated all my board names to what the board is about. Previously my board had "fun" and "quirky" names such as "With all my..." and I pinned pictures of heart-related things. This board is now called "Heart | With all my..."
Below is a further example of how I've re-named my boards. For the second half of the month, I'm going to focus on going through each board and making sure they have relevant pins on them. I get into lazy habits and dump everything on one of the boards in the recently used. I always mean to go back and move then but looking through my boards it doesn't look like I have ever done that! I will also update the board descriptions as I don't think any of my boards have them. I'm also planning to check through my links to make sure they are still active as I've deleted some of my older blog posts and I've got into the habit of pinning from my phone so a lot of my links are mobile ones and I think that I need to change those to be standard links. In theory by blog should auto display a mobile view if opened on a device. My other aims for the month were to post twice a week on my blog and I have been doing that. I'm itching to post more often but my sticking to the two posts I can make sure I'm editing pictures. One of my major achievements for the month has been clearing out broken links, it's been on my blog admin things to do list for about 6 months and I spent around 3 days clearing them out. I also deleted a few old posts as they were just terrible and I'm not too worried about that. I did think of trying to re-edit them but in the end, I decided to face the situation and press that delete button. I'm re-running the broken link check every few days but I'm making it a monthly task to check and clear any newly broken links (They break for various reasons. A blog address expires, a website removed linked address from their websites - This happens a lot with links to retail websites). Two other things that I have done are update my blog template. In January I added a free template and wasn't happy with it, it was better than the original blogger template but I didn't like it. I'm not 100% happy with what I've got and I'll be making a few more tweaks in the next week or so. I can't work out how to use the header that is shown with the template to show which is frustrating but I do quite like the simple header that I have at the moment, so I'm not too worried about changing this right this second. What I would like to do is to centre the Bloglovin and HIBs 100 badges, this shouldn't be too difficult and I'm assuming I just need to add a line of code to say equal centre but I haven't worked out what to add yet. EDIT: I have been able to centre align the Bloglovin one but not HIBs. The second thing that I have done is to update my pages; contact, about me & disclaimer. I haven't made too many changes but I can strike it from my ongoing to-do list. YouTube has been neglected. I started well posting three times a week. However, I've been poorly and didn't film anything so I don’t have any content to put up. Another area I'm struggling with is having light to film and I need to make the most of my weekends and get a plan of things to film and sit down and edit so I can get back into the swing of things. My channel is very small and I don't earn from it so it's not the end of the world that I'm not putting up content. One of the area's that I'm struggling with, is deciding on photo styles. I'm using Canva to create and edit my Instagram photos and create blog graphics. What I can't decide on is should I pick one template and always use that for all my posts or is it ok to pick a different one in almost every post? My overall feeling about my progress is that I'm really happy. I know it might seem that I'm making a bigger deal than needed over these goals but I'm hoping by setting targets and being strict. I'm hoping my being strict now I can get into good habits and look back at my blog and feel proud of it. If you've made it this far well done and I would really appreciate it if you'd follow me on my Pinterest Account.